Growing up with parents in the restaurant industry and Stone Brewing a short distance away, it’s no surprise that chef Dan Micolino’s career is rooted in the intersection of beer and food. As Pelican Brewing Co.’s new research and development chef, Micolino wants to elevate the Oregon brewpub’s culinary reputation “to match our world-class beer.” From repurposing raw brewing ingredients to questioning the future of animal-sourced protein, Micolino is positioning himself on the cutting edge of beer cuisine. What’s your approach to incorporating beer into recipes? The wonderful thing about working for a restaurant that runs its own brewery operation is that I have a fantastic wealth of not just beer available at my fingertips, but also beer ingredients. For instance, one of our signature dishes is a pale malt-encrusted salmon, where we’re using actual brewery ingredients to focus in on our food. If someone were visiting Pelican, what meal and beer would capture the spirit of the Oregon coast? It’s hard to say anything but clam chowder. One of our recommended pairings is actually our clam chowder with the [blackberry- and currant-infused] Tsunami Stout because the interplay of the flavors works phenomenally well. I can’t think of another brewery-restaurant where you can actually sit on the patio with your feet in the sand drinking a craft beer that was made on site. Pelican’s 2018 Brewers Dinner series explores the region’s relationship to cuisine through a “past, present, future” format. What can diners expect from the “Future” dinner this fall? The Future dinner is probably the one I’m most excited about because we get to explore how science and technology are changing the landscape of food and what we’ll be eating in the next five, 10, 20 years, as well as looking into sustainability—what we’re still going to have available, and what products won’t [be] available in 10 or 20 years. We will [also] be featuring a few elements of nouveau cuisine and molecular gastronomy. What kind of a journey do you try to create when designing a beer dinner? It can be a little daunting when I have to start the initial concept, because our Brewers Dinners are all themed, and we want to tell a story through the meal. […] A lot of it is based in a discussion of locality and being able to pull in regional ingredients. For example, the “Present” dinner started with an Asian street food-inspired course. All the same ingredients [for that dish] are grown locally on the Oregon coast, so we can do our version of that and it ties into the theme as a whole. What changes would you like to see in terms of how food and beer are produced in the future? 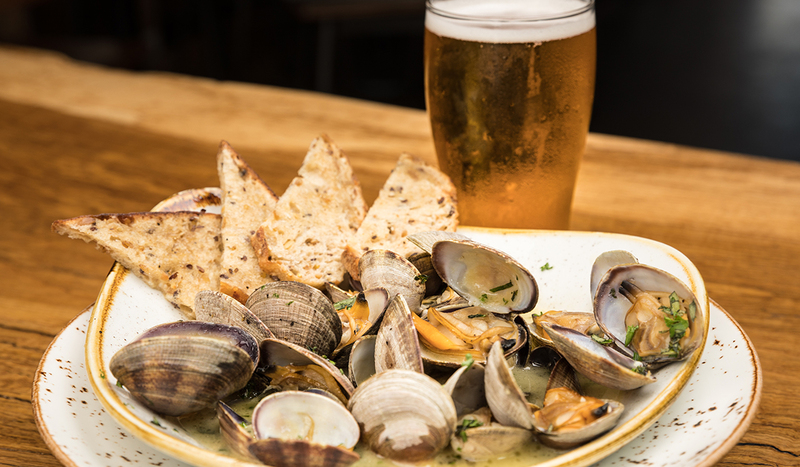 Being able to have food and beer that’s crafted with the most local ingredients that you can get. If we can do a small batch beer where we’re featuring a produce or a floral element, and we’re getting that from someone who’s just down the road, it builds community [and] a symbiotic relationship. We need to focus on being good to the people around us and showing off what we’re doing in our own communities.